Specific information about this period of Weddington's history is thin on the ground. Whilst records suggest that a Royal Hunting Lodge from the time of King John may have been built at Weddington around 1210, this has never been located. It may have been in the vicinity of St James Church or further afield*. Many such buildings of this time, which provided accommodation for the Lord of the Manor, were subsequently built on, with their foundations providing the base of later manor houses. It is thus possible that such a building may have formed the basis of the later Weddington Castle, although this cannot be said for certain. What IS certain is that life for the inhabitants of the Manor of Weddington at this time would have mirrored that of much of medieval England - i.e. extremely hard and harsh! Throughout this period and into the fourteenth century, most of Weddington’s residents would have worked as farmers in fields owned by the Lord, with their lives controlled by the farming year. Their lives were tough but there was little opportunity for rebellion due to a harsh system of law and order. The peasants were at the bottom of the Feudal System and had to obey the local Lord to whom they had sworn an oath of obedience on the Bible. Because they had sworn an oath to their Lord, it was taken for granted that they had sworn a similar oath to the Duke, Earl or Baron who owned that Lord’s property. This description would have certainly applied to the residents of Weddington despite the fact that much of the manor of the time was of the more valuable meadow type (i.e. land bordering streams and rivers, which was used both to produce hay and for grazing, as opposed to pasture land where animals grazed all year round). 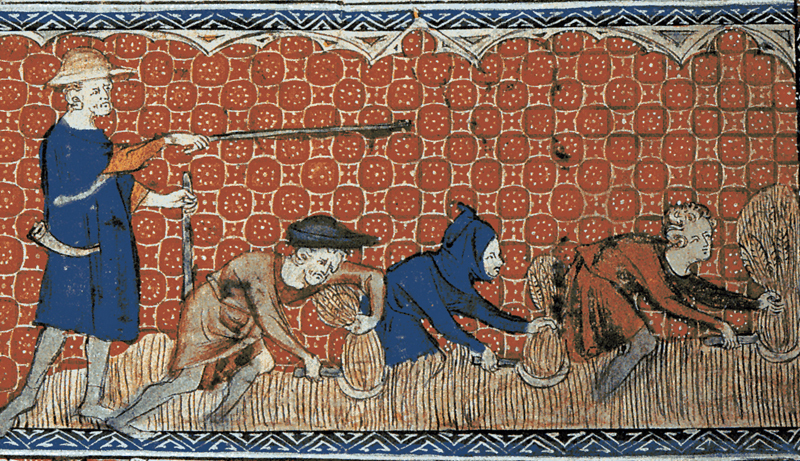 The main thing a peasant had to do in medieval Weddington was to pay out money in taxes or rent. He had to pay rent for his land to his Lord and he had to pay a tax to the Church called a tithe. This was a tax on all of the farm produce he had produced in that year. A tithe was 10% of the value of what he had farmed. This tax could make or break a peasant’s family. A peasant could pay in cash or in kind – seeds, equipment etc. Either ways, tithes were a deeply unpopular tax. The Church collected so much produce from this tax, that it had to be stored in huge 'tithe barns'. Peasants also had to work for free on Church land. This was highly inconvenient as this time could have been used by the peasant to work on their own land. However, the power of the Church was such that no-one dared break this rule as they had been taught from a very early age that God would see their sins and punish them. After you had paid your taxes, you could keep what was left – which would not be a great deal. If you had to give away seeds for the next growing season, this could be especially hard as you might end up with not having enough to grow let alone to feed yourself. 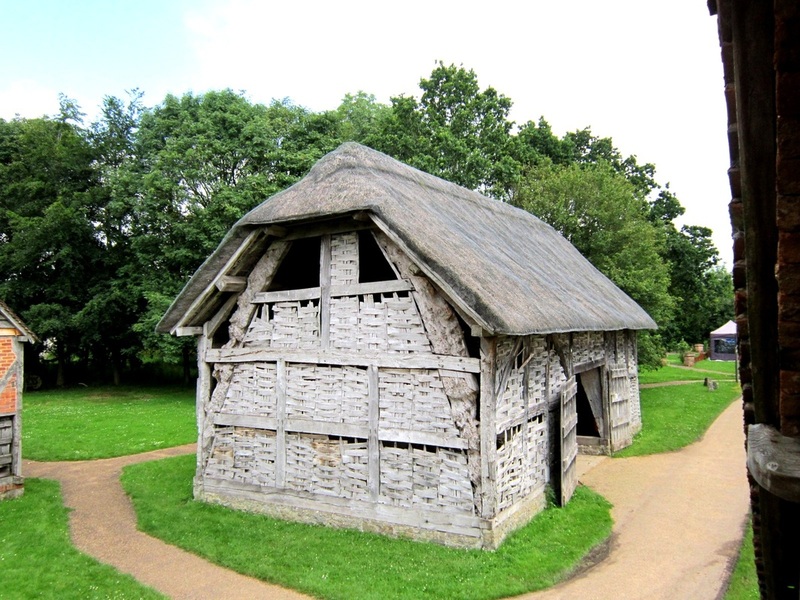 The peasants of Weddington would typically have lived in 'cruck houses'. These had a wooden frame onto which was plastered wattle and daub. This was a mixture of mud, straw and manure. The straw added insulation to the wall while the manure was considered good for binding the whole mixture together and giving it strength. The mixture was left to dry in the sun and formed what was a strong building material. At night, any animal owned by the peasants would be brought inside for safety. There were a number of reasons for this. First, wild animals would have roamed the Warwickshire countryside at this time. England still had wolves and bears in the forests and these could easily have taken a pig, cow or chickens. The loss of any animal could be a disaster but the loss of valuable animals such as an ox would be a calamity. If left outside at night they could also have been stolen or simply have wandered off. However, this would have made the house even more dirty than it usually would have been, and they would have also brought in fleas and flies etc. increasing the unhygienic nature of the house. The houses would have had none of the things accepted as normal in the Weddington of today – no running water, no toilets, no baths and washing basins. Soap was unheard of and as was shampoo. People would have been covered with dirt, fleas and lice. Beds were simply straw stuffed mattresses and these would have attracted lice, fleas and all types of bugs. The toilet would have been a bucket which would have been emptied into the River Anker at the start of the day. Water had a number of purposes for peasants – cooking, washing etc. Unfortunately, the water usually came from the same source. The nearby River Anker provided Weddington with water but this water source was also used as a way of getting rid of waste at the start of the day. It was usually the job of a wife to collect water first thing in the morning in a wooden bucket. It was said that a peasant could expect to be fully bathed just twice in their life; once when they were born and once when they died! Face and hand washing was more common, but knowledge of hygiene was non-existent. No-one knew that germs could be spread by dirty hands. Families would have cooked and slept in the same room. Children would have slept in a loft if the cruck house was big enough. The lives of peasant children in Weddington would have been very different to today. They would not have attended school for a start. Very many would have died before they were six months old, as disease would have been very common. As soon as was possible, children joined their parents working on the land. They could not do any major physical work, but they could clear stones off the land – which might damage farming tools – and they could be used to chase birds away during the time when seeds were sown. For all peasants during this time; life was nasty, brutal and short. In contrast, the accommodation of the Lord of the Manor would have been much more comfortable. Few original Medieval manor houses still exist, as many manor houses were built onto over the next centuries. Manors were built of natural stone and they were built to last, and their very size was an indication of a Lord's wealth. By Tudor and Stuart standards, Medieval manors were reasonably small, but by the standards of Medieval England, they were probably the largest buildings seen by peasants of Weddington. Records suggest that a Royal Hunting Lodge may have been built at Weddington around 1210, serving as the Lord’s ‘Manor house’. The key use of such buildings however, would have been to provide lodging for Royal Hunting parties when attending hunts in the area. The date of 1210 would have put this construction in the reign of King John, who was a keen huntsmen and built many such lodges, especially in neighbouring Nottinghamshire. As regards the Lords of the Manor of Weddington, the estate continued to pass down the Astley family lines during this century: Walter de Astley is recorded as holding a knight's fee at 'Wetintone' in 1235 and a Thomas de Astley is recorded in 1242. The latter was slain in the Battle of Evesham in 1264 and the land reverted to the King, although one Andrew de Astley later redeemed the family estates. Weddington continued to be held by the Astleys for another two centuries**, later passing down the female line of Astleys finally to Reginald, Lord Grey in 1450. * A single coin dated 'King Edward I', c1302 AD was found in Elmfield Road, Weddington, some years ago - this may have been lost by a coin collector or it may represent an 'in situ' remain that was lost in the area around 680 years ago. This coin could prove to be an indicator that the Royal Hunting Lodge was in the area of Elmfield Road. The certainty of a Hunting Lodge of King John's time being based at Weddington is not proven, although a number of local historical and media reports do refer to this - even up to the 1920s: see image below from the Portsmouth Evening News of Monday 25 September 1922. ** An ancestral history of the Astley family (former owners of the Castle) 1336 - 1531 from the book:"Plantagenet Ancestry: A Study In Colonial And Medieval Families" by Douglas Richardson, Kimball G. Everingham, , David Faris (pp45-47) can be accessed by clicking here †.